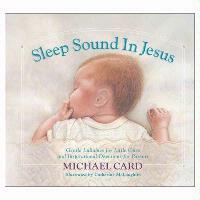 Sleep Sound in Jesus is exactly what it sounds like -- a gentle, soothing album of Christian lullabies. Michael Card wrote all the songs and performs the vocals with Betsy Hernandez. Ordinarily, having all the songs on an album blend together is a weakness, but for this album, it's a strength. The songs work together to create an atmosphere of calm in the often stormy lives of families with infants. Michael uses a light touch, keeping the instruments acoustic and the vocals soft. The album's message of love and belonging is simple and sweet. Scroll down to see the titles and listen to the songs which Betsy recorded. Selecting the 'Buy' button will take you to 'iTunes' where the entire album can be purchased!